LOCATION: On Double Still Road in the NE/4, NE/4 Section 20, T5S-R8W. DIRECTIONS: East of the old Double Still turpentine site, which is in the SW/4, SW/4 Section 17, T5S-R8W. 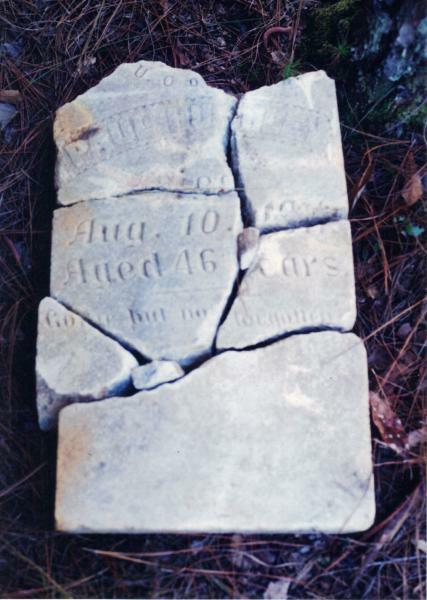 HISTORY: A heavily, shattered tombstone was found in Section 20, T5S-R8W by deer hunters in January 1995. It is a believed that a paper company bulldozer ran over the tombstone and severely mangled it. The broken stone was brought to the hunting camp of Elvin Ramsay (b. 1907). Mr. Ramsay's granddaughter, Lorrie Ramsay Massey, notified Ray L. Bellande of the find. The USGS Topographic Map Vestry (1954) (Scale 1:62500) has the word "grave" depicted in the exact area that the recent tombstone was found. U.O. is part of a Lodge designation, probably GUO of OF, Grand United Order of Odd Fellows. It is believed that Paul Hughley was probably a black turpentine worker.